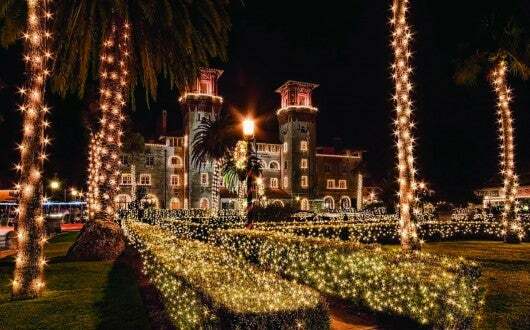 What’s more delightful during the holiday season than glittering light displays? TPG contributor Michele Herrmann set out to uncover which cities truly sparkle this time of year — and here’s what she discovered. 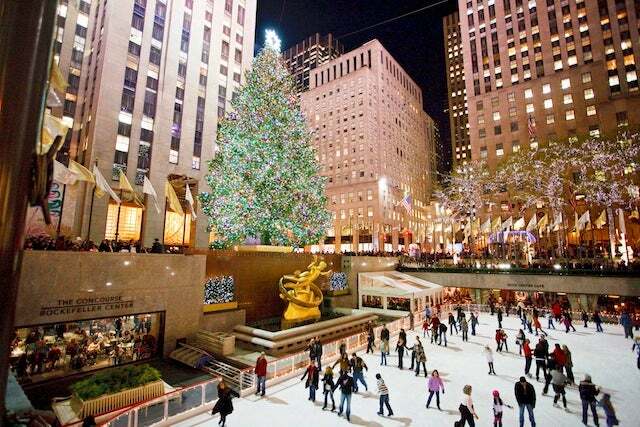 Head to Rockefeller Center and take in the splendor of the Rockefeller Christmas Tree. A holiday tradition for over seven decades, this towering symbol of good cheer is covered in thousands of energy-efficient lights and topped with a Swarovski crystal star. While in Manhattan, also head to the major department stores like Macy’s, Barney’s, Bloomingdales, Lord & Taylor and Saks Fifth Avenue to enjoy their festive window display, which range from traditional to modern to avant-garde. You might also want to venture to Brooklyn’s Dyker Heights, as this neighborhood features impressive lights, decorations and amusements. For something sweet, visually savor delectable edibles at the Gingerbread Lane exhibit at the New York Hall of Science in Queens. Since 1956, the Macy’s Christmas Light Show at Macy’s Center City has spruced up a large wall inside the historic Wannamaker Building with almost 100,000 LED lights creating shining holiday images of snowmen, stars and more. There’s plenty of outdoor scenery, too. 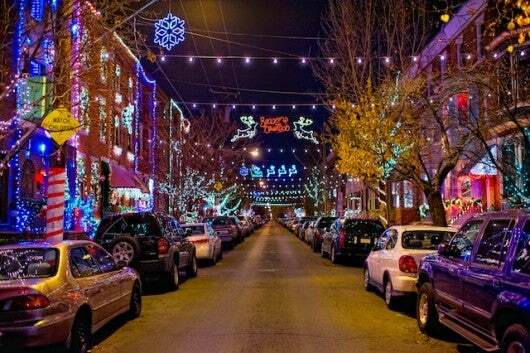 In South Philly, neighborhood lawns sparkle with holidaycheer on the 2700 block of Smedley Street and the 1600 block of South 13th Street. The star attraction at the 30-minute “Electric Spectacle: A Holiday Light Show” at Franklin Square is 10-foot-tall sparkling kite, and you’re sure to find the magic of season during a stroll along the European-inspired Christmas Village at Love Park. The “Miracle on 34th Street” display has been a Baltimore tradition for more than six decades. Though moviegoers may associate “Miracle on 34th Street” with a different city, this title also refers to an event in Baltimore’s Hampden community that’s been going on for over 65 years. Residents string lights between their row homes and decorate their properties with inflatable snow globes, musical trains and blinking angels. The lights are on every night now through January 2, and you can drive or walk through this cheery, glowing street to take in the whole scene. The Windy City has indoor and outdoor displays that capture Chi-Town’s festive spirit. First, escape from the cold inside the Museum of Science and Industry, where the annual “Christmas Around the World and Holidays of Light” exhibit showcases more than 50 holiday trees and cultural displays decorated by volunteers from Chicago’s various ethnic communities. 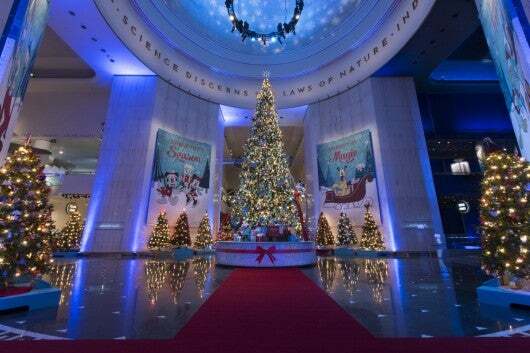 This year, the museum’s grand tree has a Disney theme based on a temporary exhibit of artifacts from the Walt Disney Archives. Inspired by the Christkindlesmarkt in Nuremberg, Germany, Christkindlmarket Chicago brings European tradition to Daley Plaza, so visitors and locals can get authentic German foods and goods without going too far. The oldest city in the United States puts on Nights of Lights, an annual public lighting display inspired by the Spanish tradition of displaying a single white candle in windows during the Christmas season. This tradition dates to the time when St. Augustine was the capital of the Spanish settlement of La Florida, and has been kept alive in the city for nearly 250 years. Today, though, it’s a much larger affair, with more than three million white lights bring on the event’s nightly illumination. The switch gets turned on in mid-November at the Plaza de la Constitucion, then later travels to other area landmarks and locations. A longtime New Mexico tradition, luminaries (or luminarias) are white paper bags containing votive candles, typically lining residential streets and driveways and creating a lovely holiday glow. 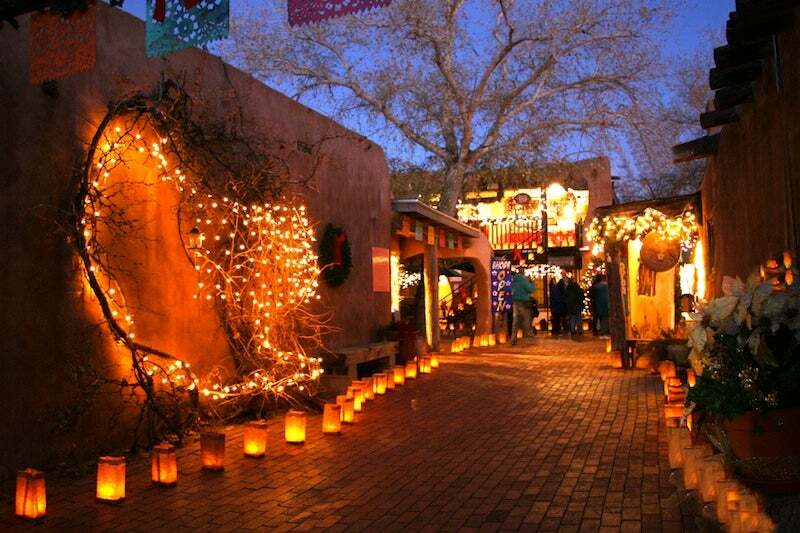 Every Christmas Eve, ABQ Ride’s Luminaria Tour guides its guests on a ride around Albuquerque’s historic Old Town section for a viewing of private neighborhoods twinkling with luminaries and other festival lights. In ABQ BioPark Botanic Garden, the River of Lights is an annual holiday spectacle of twinkling displays, animated sculptures and a synchronized music and light show. Portland has a mix of holiday light displays, both large and small. Since the 1920s, residents of Peacock Lane have gotten a lot of traffic from crowds coming to see their festive Tudor homes — so much so that it’s often closed to cars altogether. Visitors find everything from nativity scenes to life-size Santas. 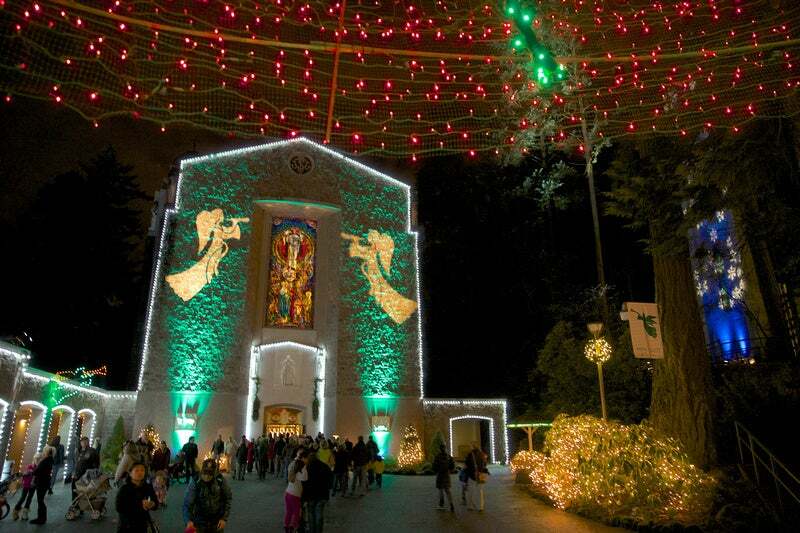 In northeast Portland, the walk-through Christmas Festival of Lights at the Grotto features indoor evening choral performances, as well as children’s activities. Plus, the Oregon Zoo’s ZooLights can be enjoyed from a train ride that takes visitors throughout the zoological garden and into special hidden spots. 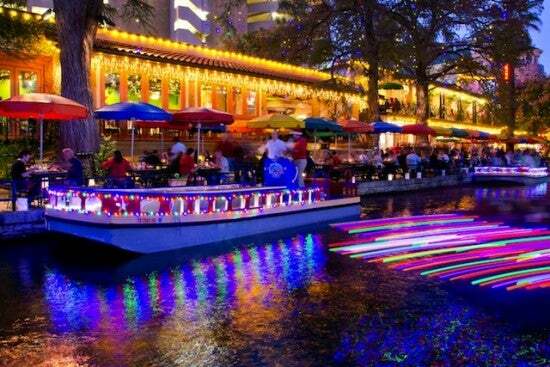 During the holidays, the famous San Antonio River Walk is brightly and colorfully lit. During the holiday, the famous River Walk features almost 200 trees graced with twinkling lights and 20 bridges colorfully illuminated in various patterns. On weekends through December 21, the Ford Fiesta de las Luminarias lines the River Walk with 6,000 luminaries to symbolically light the way for the Holy Family. Festive lights in San Antonio even go underground, as Natural Bridge Caverns stages its first-ever subterranean holiday show. Beverly Hills’ famous Rodeo Drive is donned with Baccarat chandeliers and 150,000 lights. California may be seasonally warm, but its holiday lights invoke winter cheer. For this particular holiday season, Beverly Hills is getting pretty fancy: the median of Rodeo Drive is blinged out with 16 full-size Baccarat chandeliers, approximately valued at $1 million. 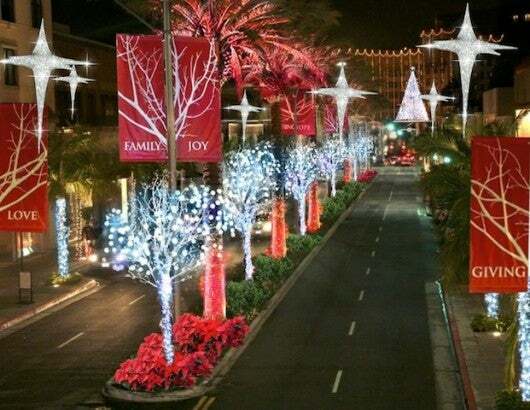 Additionally, glowing birch trees, iridescent palms and hundreds of red poinsettias will grace this famous high-end street, as well as red, silver and gold décor, a 30-foot Christmas tree, a nine-foot tall menorah, and live carolers and musicians. And for a few days before Christmas, snowfall (albeit artificial) is even on the schedule. 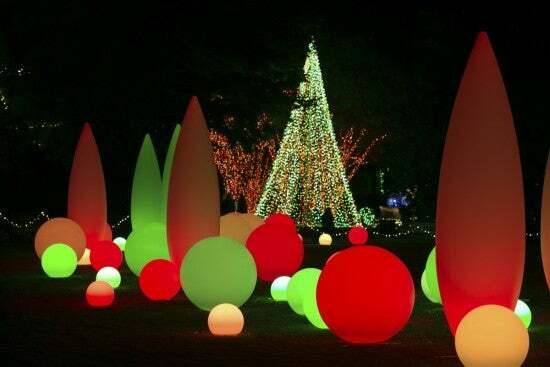 Atlanta Botanical Garden’s Garden Lights Holiday Nights creates a colorful landscape. The Garden Lights Holiday Nights show at the Atlanta Botanical Garden makes its 30-acre landscape bright with 1.5 million twinkling holiday lights. Each section of the garden has its own color scheme and display. Another Atlanta tradition, the Holiday in Lights, transforms Centennial Olympic Park into a winter wonderland, complete with an ice skating rink. TPG Tip: When it comes to traveling this holiday season, the Chase Sapphire Preferred is a great card to use, as it offers 2x the points on dining and travel. What’s your favorite holiday light tradition?